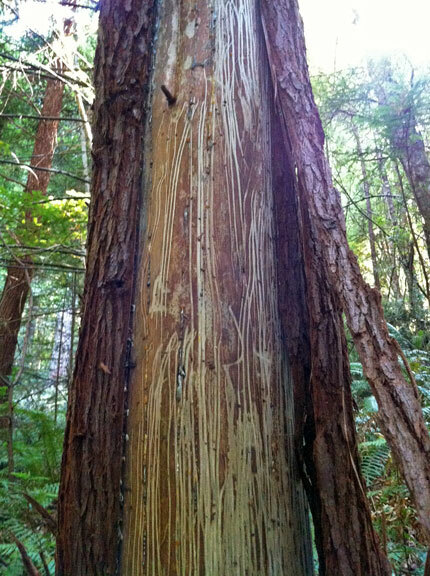 Scraping teeth of a bear left this young redwood missing bark. Black bears rumble through northern redwood forests in search of food and are highly attracted to the scent of growing redwoods. Bears tear bark off of young, vigorously growing redwood trees in search of a snack. The bears can strip many feet of bark off young redwoods and then scrap away and eat the underlying nutritious tissue on the tree trunk. These hungry bears are eating tissues called the cambium and phloem. Cambium is a thin layer of cells that produces wood and bark, while the phloem is the tissue that transports sugars made in the leaves. When redwoods grow quickly, more sugars are produced and transported under the bark of redwoods, which brings in the bears. Typically, bear munching on redwoods only occurs in very young stands of trees. In recently harvested forests, young trees respond to the extra light, growing space, and resources that become available after their neighboring trees are cut and they begin to grow fast. Bears have learned that young redwoods are super tasty and I’ve heard reports of mother bears teaching their cubs to gnaw on redwoods. While black bears are a natural part of the redwood forest, they are capable of chewing many redwoods in the same area which can hamper forest restoration efforts and lower the timber value of commercial forest. With all that said, I love finding the signs of bears in the woods. Bear-gnawed redwoods are really interesting to look at closely and sometimes you can see their teeth and claw marks in the exposed wood. Have you see this on any redwoods in the forest?